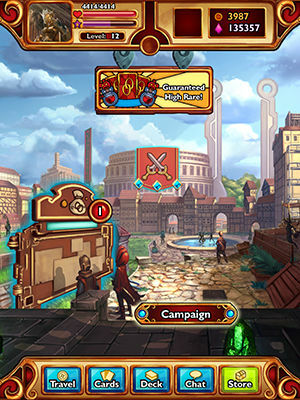 Half collectible card battler, half RPG dungeon crawler, Outcast Odyssey struggles to move beyond the dry click-win proposition of many mobile trading card games (TCG) games on the mobile market to provide the player with something richer in content (and cards), much more engaging... and much, much prettier. To this end, it's hard to say that they haven't succeeded. Founded in 2010 by core members of the team behind Stephen Spielberg's BOOM BLOX, mobile game makers Magic Pixel Games have a history of delivering successful titles in all shapes and sizes. 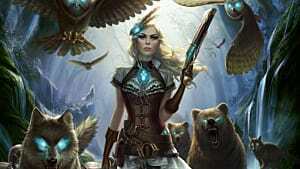 Combined with the talents of featured comic book artists Warren Louw and Chuck Pires, the result is a charming mix of strategic card battling, interesting card effects, and multiple versions of lovingly painted cards straight from the indie art scene of deviantART. I first heard about this title when I caught up with Bandai Namco at Comic Con, specifically with Outcast Odyssey producer Joe Riego, to discuss Bandai Namco's stake in the mobile market and some of the new free-to-play titles they'll be pushing out. To see how Riego's eyes lit up upon talking about Outcast in particular and combined with my own personal bug for collecting all the things, it's no wonder how I got so hype about trying this game out for myself. Unfortunately, while Outcast is available on both iOS and Android (and I got to see it in large-scale splendor on the iPad), it wasn't compatible with my Nexus 7 tablet. As it stood, I was still able to play it on my phone... but sporting a cracked screen and with a penchant for restarting randomly, doing so made it difficult to say whether or not Outcast crashed as often as it did (and it does quite frequently) because of the hardware I was running it on, or as a function of the game itself. For this, I give the game the benefit of the doubt. It is worth mentioning that the game bounces back from crashes very, very well. It's gratifying to note that while it gets frustrating to constantly start up the game again, very little of your hard work is actually lost. Map progression is saved and you can pick up right where you left off (barring perhaps a handful of taps to clear a particular area which is nothing). This is especially useful when running Bounty missions for rare cards as I have not yet come across a situation where I could not access my bounty mission after a crash. From the game's main staging area, you have the choice of playing Campaign, doing Bounties, and PVP. While these may seem different at first glance, they really boil down to doing the same thing. 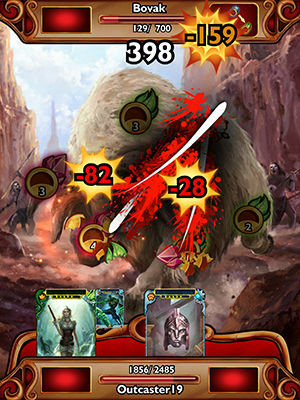 The meat of Outcast's gameplay is the card battle system (pictured right), and this is the essential part of playing all of these modes. There is a story in Outcast Odyssey but you will be hard-pressed to find it in the actual game itself unless you pay strict attention during the tutorials - and even then you don't get much. Suffice to say, the RPG elements of Outcast refer strictly to the dungeon crawler aspects of Campaign games where you traverse a map and fight pitched card battles against enemies in order to unlock more portions of the map (and pick up small rewards of EXP, gold, etc. as you go!). Bounties can be played for a chance at rare cards, and these are a variation of the Campaign maps with a roulette-style chance to grab enough gold once you've completed all your map objectives to win the rare. One bounty ticket is given once per day for logging in, and you can pay for more using in-game currency (purchasable for real money through the in-app Store). PVP feels like a bit of a misnomer because there is actually very little little player-to-player interaction involved in this game unless you poke your nose into the Chat panel or making friends and joining a Guild. 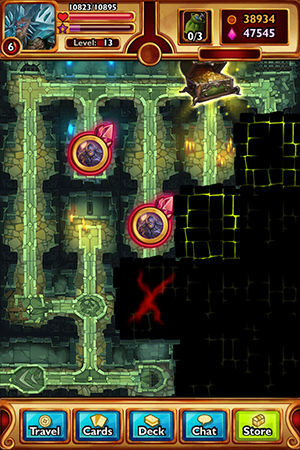 In this mode, you pit yourself against the decks of other players chosen to be Easy / Medium / Hard compared to yours. The main differences in this mode is that the experience is pared down to a single card battle, and one with higher orb numbers than you're probably used to seeing in the regular campaign. Your Battle ticket is recharged every hour (if you want to play without paying). As for the card battling, Outcast delivers on its promise of providing a more interesting take on the card game concept by introducing a modicum of strategy into gameplay. Not merely a numbers game of Attack vs Defense, battling in Outcast is comparable to playing Ro-Sham-Bo or rock-paper-scissors (I was reminded strongly of the premise behind Sirlin Games'sYomi fighting card game) with an added chance of procing skills. Much of the strategy feels like relying heavily on the chance for those skills to proc in order to win - and this has less to do with how you plan out your gameplay, and more to do with choosing the right cards with high skill chances. Most of your battles (especially against those with higher numbers in the target orbs) will involve whittling them down by degrees waiting for a proc. Outside of the card battling, the experience is simple and borders on grindy - whether you go the free-to-play route or choose to pay for chances at better cards. Most of your time is dedicated to winning cards from random battles, then feeding them into your main deck in order to max out their EXP so as to evolve into a next-tier card. 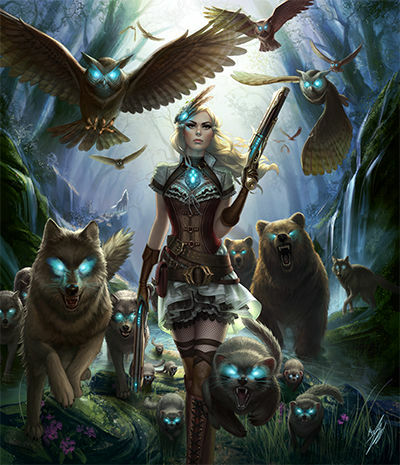 Building up your collection will take a long while, but the game does nothing to hurry you, and the experience doesn't feel forced in any way - if you die in campaign, you have an average wait time of about 7 minutes before you can try again (longer if you want to reach full health first) and getting your hands on a potion for instant full health is not hard to do. You are encouraged to spend in-game currency (and by extension, real money) on upgrades and card packs to get everything faster, but it is not a necessity and doesn't feel like one. All in all, I found Outcast Odyssey a perfect game for casual play, with just enough potential for social interaction (the reality of it is mostly randoms asking you to use their referral code) to keep things from clogging up your social media - something games like Candy Crush could stand to learn a little about. Gameplay is repetitive but largely enjoyable, and the game makes no bones about being completely okay with you stepping away from it for a little while. This game has been a staple on my phone ever since its release late last month, and I highly suspect this is not going to change for a long, long while. You can check it out for yourself on the App Store and Google Play! 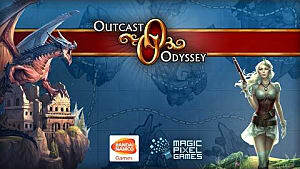 A casual mix of RPG dungeon crawling, card battling, and collecting pretty cards, Outcast Odyssey is the perfect game to play while you're at work. Er. I mean.